Learn here the way to save the forest from dying, we have explained ways to conservation of forest in 2018 and why it is important to us! Forests are the bearer of life. We depend on forests for our survival. The air we breathe in, the woods we use, all are provided to us through the means of the forest. Not only this, but forests also provide us with a livelihood; it is also a habitat for wild animals. Forests are the backbone of the life forms and the life on earth sustained through them. It maintains a complex ecosystem consisting mainly of trees that support many forms of life. Forests are of great use for human beings and it needs to be conserved. The act of protecting someone or something is called conservation. Every action is a reaction of influence or inspiration. To conceptualize anything, an immediate initiative has to be taken. In the case of conservation of forests, an act has been made, “Forest (conservation) Act in 1980” and its amendments were made in 1988. It is an act to provide for the conservation of forests and for matters connected therewith or ancillary or incidental thereto. As mentioned earlier, forests are very important to us. Life would not be able to sustain if forests disappear. Not only this, the earth would come to an end if forests are not there to regulate it. There are several ways through which forests can be saved, so read below the conservation of forest. If practiced these methods, the ecosystem would be balanced. A regular check should be given on the number of trees that have been cut. A planned graph should be made before cutting trees in an area. No extra trees should be harmed. In fact, a reasonable number of trees should be allowed to cut if they are being of some use. The major loss of forests is mostly done through a forest fire. A forest fire can be of two types, first, natural fire and second, man-made fire. When the fire is spreading naturally, there should be a check on it. Instead, it should be controlled. Manmade fire disturbs the whole ecosystem leading to an increase in global warming. Forest fire in previous times was initiated by the tribal people as an outcome of Jhum cultivation. But it was then practiced in a proper manner, tribal people came back to that very land where they set on fire and grow more trees on that land. This should be your moral duty if you are cutting a tree, you should grow a tree instead of it. This would rather help in equalizing the number of trees. Afforestation can help to maintain an ecological balance as the number of cut trees would be equal to the number of trees planted. This is a really good step towards a bright future. Even the future generation can see trees growing and would inculcate this habit of planting trees. This can be really good for the earth as well as for humans as a moral figure so next time you get an opportunity then you can use these conservations of forest ways. Forests are necessary elements of the earth. We need to conserve it because if forests are destroyed, animals and other creatures of the forests will come out to human settlements searching for a place to stay. Animals will be killed more and more by humans. Environment goes into an imbalance. Humans will start fighting each other for wood and other plant materials. They will end up destroying each other for forest areas. Slowly and steadily, the carbon dioxide level rises all over the world. Another alarming situation is rising, we need to act now. Read more about Saving Natural Resources & Its Conservation. Rains will become scarce, heat level in the world will increase to a very high level and soon many places will become arid and dry. The snow-clad peaks of mountains, frozen rivers and the ice at the poles will all melt at a rapid pace. Not only these, wild animals, who thought to the forest to be their home, would wander in the streets creating havoc. This can lead to the destruction of developed areas and ultimately can create a danger to the human life as some dangerous creatures such as lions, tigers and elephants can create chaos in your residential area if they are set free. Therefore, proper management is needed for conservation of forests else it would result in the devastation of the earth. 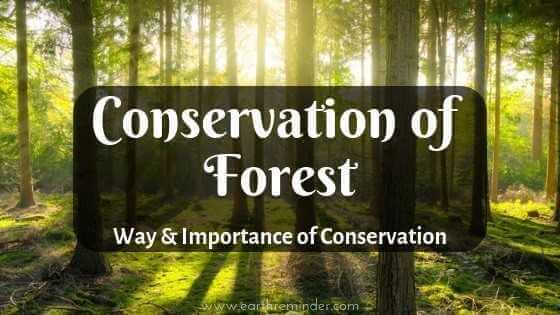 Hope you like our article on conservation of forest, if you have your own ideas then you can comment below and we will include them here. Also, don’t forget to share these with your friends through Twitter – Follow @earthreminder and Facebook wall to increase the awareness in the rising issue, we need to tackle now.